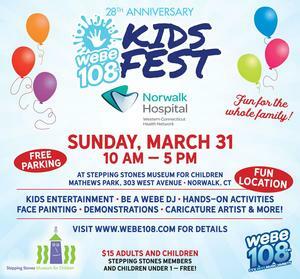 Join Western Connecticut Health Network (WCHN) and Connecticut Children’s Medical Center at the 28th annual WEBE108 Kids Fest for a day of entertainment and valuable healthy living information. There will be music, fun activities, face painting, a caricature artist and more! Experts from WCHN’s community hospitals — Danbury, New Milford, and Norwalk — and Connecticut Children’s will conduct blood pressure screenings and weight/height measurements. During “Ask the Expert” children and their families will learn about healthy eating, concussion and injury prevention, and the importance of exercise, among other topics. The Norwalk Hospital emergency medical services (EMS) staff will provide tours of an ambulance. Plus, kids can climb aboard an EMS utility task vehicle (UTV) too! Please call (203) 852-2250 for more information about WCHN and Connecticut Children’s booth at Kids Fest.